Hokusai's "Great Wave," as it is commonly known today, is arguably one of Japan's most successful exports, its commanding cresting profile instantly recognizable no matter how different its representations in media and style. In this richly illustrated and highly original study, Christine Guth examines the iconic wave from its first publication in 1831 through the remarkable range of its articulations, arguing that it has been a site where the tensions, contradictions, and, especially, the productive creativities of the local and the global have been negotiated and expressed. She follows the wave's trajectory across geographies, linking its movements with larger political, economic, technological, and sociocultural developments. Adopting a case study approach, Guth explores issues that map the social life of the iconic wave across time and place, from the initial reception of the woodblock print in Japan, to the image's adaptations as part of "international nationalism," its place in American perceptions of Japan, its commercial adoption for lifestyle branding, and finally to its identification as a tsunami, bringing not culture but disaster in its wake. 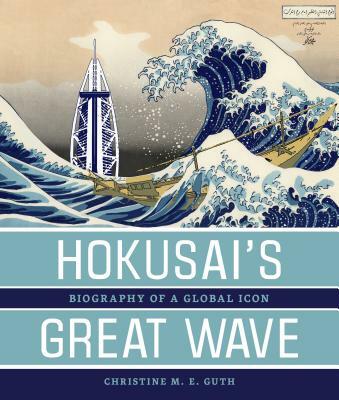 Wide ranging in scope yet grounded in close readings of disparate iterations of the wave, multidisciplinary and theoretically informed in its approach, Hokusai's Great Wave will change both how we look at this global icon and the way we study the circulation of Japanese prints. This accessible and engagingly written work moves beyond the standard hagiographical approach to recognize, as categories of analysis, historical and geographic contingency as well as visual and technical brilliance. It is a book that will interest students of Japan and its culture and more generally those seeking fresh perspectives on the dynamics of cultural globalization.